Oracle Database parallelism and serialization is what we as Oracle Database Administrators live and die for. You have a screaming fast Oracle Database system and there is lots of computing power available. But performance is unacceptable; users are screaming, the phone is ringing, and those fancy dashboards are flashing like it's Christmastime. What is going on?! What can I do about it?! That's what this post is about. Half of the systems had a similar "problem." I think it's important every DBA understands this "problem" because it's more common than most people believe. There was plenty of computing power and the key SQL statement they cared about was a batch job. What was the core problem? The quick answer is "serialization" that is, a lack of parallelism. Exploring this using a very large production system AWR report and coming up with solutions is what this posting is all about. In Oracle systems, serialization is death and parallelism is life. 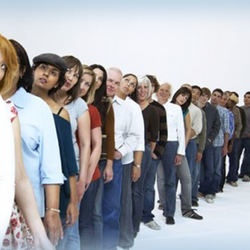 Follow this line: business, end user, application designer, DBA, Oracle Database Kernel Architects (or whatever their title is), OS Administrators, OS designers, CPU designers and IO subsystem designers all have something in common. They work hard to parallelize tasks. Just one example: Oracle is designed to have multiple background and foreground processes running parallel. But all this parallelization effort can be wasted and minimized if a process turns into a serial work stream (at any level; Oracle, OS, business, etc.). The result is "slowness" because the wall time increases. When I tune Oracle Database systems, I look for opportunities. And each of my solutions will specifically target an opportunity. When I see unused power and complaints of slowness, I look for ways to increase parallelism. Why? Because having available power combined with slowness likely means a serialization limitation exists. For sure serialization may be necessary. Two examples come to mind; Oracle database memory serialization control (think: latch and mutex) and business rules. But if I can find a way to increase performance by using up available power by increasing parallelism, I'll likely be able to turn a slow serialization situation into a screaming fast parallelization situation! It's easy to recognize a serially constrained system. Ask yourself these two questions. First, is there available CPU or IO power? Second, are there complaints of application "slowness." If the answer to both of these questions is "Yes" then there is likely a serialization issue. Furthermore, the general solution is to use the available resources to our advantage. That is, find areas to increase parallelization, which will use the available resources and improve performance. If you have the power, use it! What are you saving it for? Can I Be Out Of CPU And Be Serially Constrained? Yes. An Oracle Database system can be serially constrained and be out of OS resources. A great example of this is when there is a raging Oracle memory serialization issue. If you see both significant Oracle latching or mutex wait time combined with a raging CPU bottleneck, you likely have a serialization issue... an Oracle Database memory structure access serialization issue. So, while available power on a "slow" system likely means we have a serially constrained system there are situations in Oracle with a raging CPU bottleneck that also means there is likely a serialization issue. Find Out: Is There Available CPU Power? Here Is A Real Life Situation. To simplify, I'm going to focus on only instance number one. Look at instance number one in the below picture. The above AWR report snippet shows RAC node #1 OS CPU utilization at 15%. 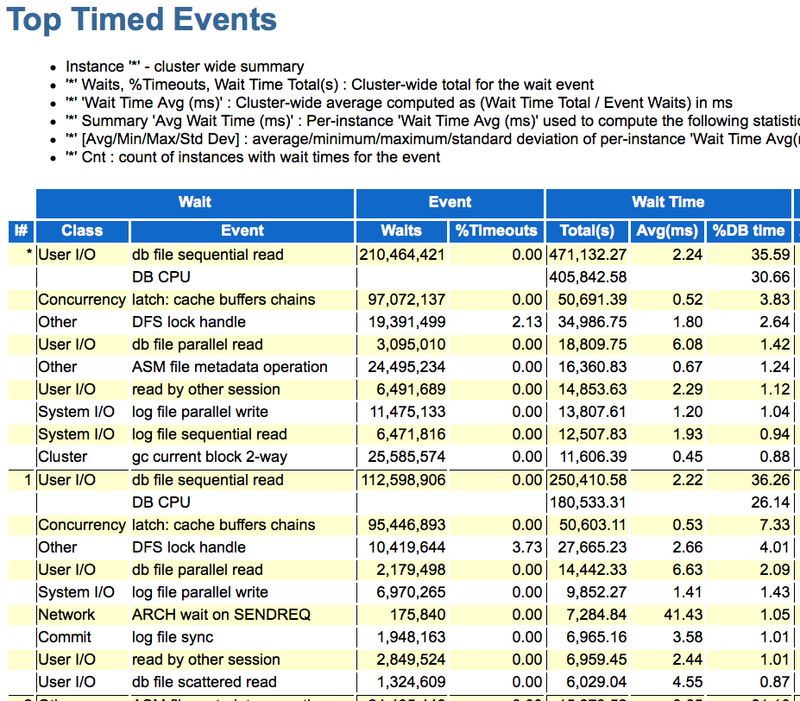 This means that over the AWR report snapshot interval, the average CPU utilization was 15%. I never initially trust an AWR report for calculated results. Plus it's good practice to do the math yourself. If you use the super fast busy-idle method I have outlined in THIS POST and detailed in my online seminar, Utilization On Steroids, the utilization calculates to 16% ( 0.5/(0.5+2.7)=0.16 ). So the AWR Report's 15% for CPU "% Busy" looks to be correct. Clearly with an average CPU utilization of 15%, we have an opportunity to use the unused CPU power to our advantage. Find Out: Is There Available IO Power? I am looking for fast IO responsiveness. That is, a low response time. A great way to get a quick view of IO subsystem responsiveness is to look at the average wait time for the event, db file sequential read. The wait event, db file sequential read is the time it takes to read a single block synchronously. I like to call it a pure IO read call: a) what time is it? b) make the IO call and wait until you get it, c) what time is it? d) calculate the delta and you have the wait time...and the IO read call response time! If you want more details, I wrote about this HERE, which includes a short video. For our system, let's figure out the single block IO subsystem read response time. Using the same AWR report, here is a screen shot of the Top Time Events. Again, I'm just going to focus on the first instance. If you look closely (middle right area), you'll see for instance number one, the average db file sequential read time wait time is 2.22ms. That's fast! There is no way a physical spinning disk is going to return a block in 2.22ms. This means that many of Oracle's single block read calls are be satisfied through some non-Oracle cache. Perhaps an OS cache or an IO subsystem cache. We can't tell, but we do know the block was NOT an Oracle's buffer cache because the db file sequential wait means the block was not found in Oracle's buffer cache. A single block synchronous IO read call with an average of 2.22ms means there is available IO read capacity and probably available write capacity as well. Again, just like with the OS CPU subsystem, we have unused power that we will try and use to our advantage. At this point, I will assume there is also plenty of memory and network capacity available. So, the bottom line is we have a "slow" system combined with available CPU and available IO power. Wow! That is a great situation to be in. I call this, "low hanging fruit." 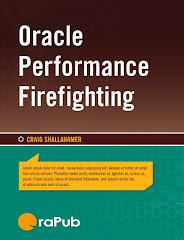 At the top of this post, I mentioned that in my Firefighting class in each of the "serialization" cases, there was a key SQL statement that was part of a larger batch process. Keep in mind, that at this point in the analysis I did NOT know this. All I knew was that users were complaining and there was plenty of CPU and IO resources. Usually, in this situation there is a relatively long running process. There could be lots of quick SQL statement involved, but usually this is not the case. And I'm hoping there is a key long running SQL statement that can be parallelized. Long running can roughly be translated into "high elapsed time." I've have written a number of articles about elapsed time (search my blog for: elapsed time) and even have a free tool with which, you can gather to get more than simply the average elapsed time. And I have online seminars that touch on this subject: Tuning Oracle Using An AWR Report and also, Using Skewed Performance Data To Your Advantage. So there are lots of useful resources on this topic. In the AWR report, I'm going to look closely at the SQL Statistics, in particular the "SQL ordered by Elapsed Time (Global)." What I really want is the statistics only for instance one, that is, not global. But that's all I have available. Plus the DBAs will/should know if the key SQL statement(s) are run on instance one. Here's the report. In the report above, look at the elapsed times (second column on the left). Now looking right, find the "Execs", that is, the executions column. The execution column is the number of completed executions within this AWR snapshot range. If the executions is zero, this means the SQL did not complete during the snapshot interval, that is before the ending snapshot. 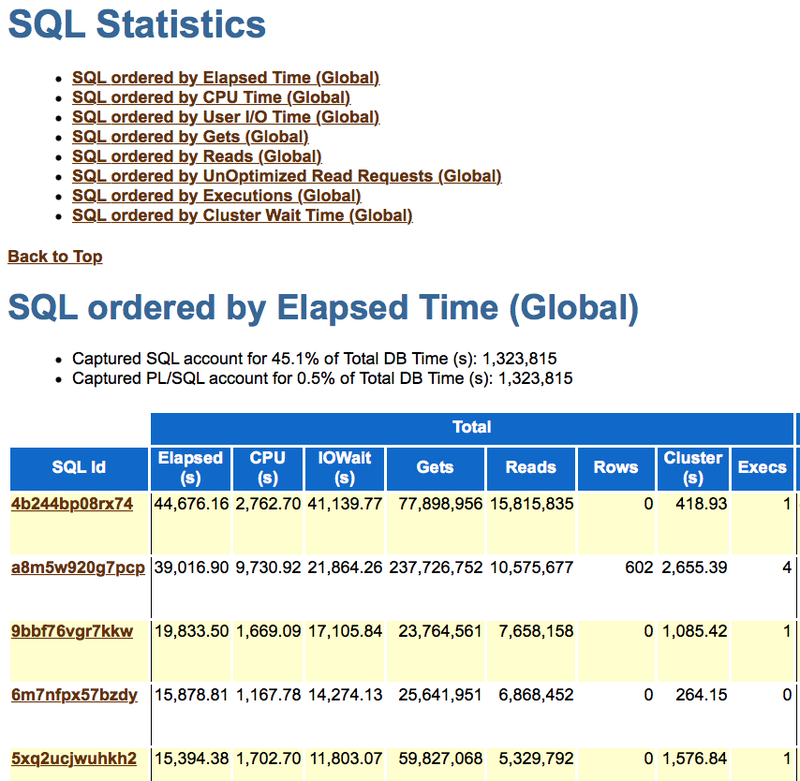 If you're wondering, these top elapsed time SQL statements are involved in batch processing. When I look at this, I see opportunity, fruit waiting to be harvested! And I love this: Every DBA in the class in this situation said, "Oh! I know about this SQL. It's always causing problems." Now it's time to do something about it! We have identified available CPU and IO capacity. And we have identified THE elapsed time SQL statement. While I'm a pretty laid back kind of guy, at this point I start to apply some pressure. Why? Because the users are complaining, we have identified both an opportunity, the cause of the problem and the general solutions. 1. Do less work. You want to empty a candy dish faster? Then start with less candy in the dish! If you want a SQL statement to run faster, tune the SQL so it touches less blocks. 2. Do the same amount of work, but group the work and run each group at the same time. This is parallelization! This is why the total elapsed time will not decrease (it will probably increase a little) but the wall time will likely decrease... and dramatically! Here is a LINK to posting that contains a short video demonstrating the difference between elapsed time and wall time. There are many different ways to parallelize. But the goal is the same: use the available resources to reduce wall time (not necessarily the elapsed time). Perhaps the application can be redesigned to run in parallel streams. But that can take a very long time and be a real hassle. But in many cases, it's the best long term solution. If you are short on time, are licensed for Oracle Parallel Query and the SQL has been optimized (oh boy... how many times have all heard that before), you likely can use Oracle PQ. And of course, even if the SQL is not optimized, you can still run PQ and performance may be fantastic. By the way, adding faster IO disks or more IO disks (what is a "disk" is nowadays anyways) will likely NOT work. Remember the IO subsystem is performing wonderfully. Thanks for reading and enjoy the mystery of your work! Do The LGWRs Always Sleep For The Full Three Seconds? Do Oracle Database LGWRs (10g, 11g, 12c) Always Sleep For The Full Three Seconds? Back in June I wrote (included a video) about the Oracle Database log writer(s) "3 second sleep rule." That's the rule we were all taught by our instructors when we started learning about Oracle yet never really knew if it was true. In that post, I demonstrated Oracle Database log writer background processes are normally put to sleep for three seconds. In this post, I want to answer a related but different question. Do Oracle Database log writer background processes ALWAYS sleep for the full three seconds? Our initial response would likely be, "Of course not! Because what if a foreground process commits during the three second sleep? The log writer(s) must wake up." That would make sense. But, is this really true and what else could we learn by digging into this? I created an experiment to check this out, and that is what this post is all about. In my June post I demonstrated the Three Second Rule. You will see this again below. But in this experiment we are looking for a situation when one of the 12c log writers wakes BEFORE their three second sleep. You can download the experimental script I detail below HERE. This is really tricky to demonstrate because of all the processes involved. There is a the Oracle foreground process and in 12c, there are multiple log writer background processes. Because this is experiment follows a timeline, I needed to gather the process activity data and then somehow merge it all together in a way that we humans can understand. What I did was to do an operating system trace ( strace ) each process ( strace -p $lgwr ) with the timestamp option ( strace -p $lgwr -tt ) sending each process's the output to a separate file ( strace -p $lgwr -tt -o lgwr.txt ). This was done to all four processes and of course, I needed to start the scripts to run in the background. Shown directly below are the log writer strace details. Once the log writers were being traced, I connected to sqlplus and launched the below text in the background as well. Then I merged the trace files, sorted them by time, got rid of stuff in the trace files I didn't want to see and put the results into a final "clean" file. There is a lot of detail in the above output. I'm only going to make a few comments that pertain to the objectives of this post. Oracle is using the semaphore call semtimedop to sleep. The beauty of this call, is it allow the process to be woken (that is, signaled) by another process! Keep that mind as you follow the timeline. 19:11:41.981934. Notice the server process' "2, 2" and later the "2,3" and "3, 1" and "3, 2"? This is the result of the dbms_lock.sleep commands contained in the sqlplus script! 19:11:42.859905. Notice lg01 and the other log writer background processes always have a "3, 0" semtimedop call? That is their "3 second sleep." Notice anything strange about the above times? They are all just about 3 seconds apart of from each other. That's the 3 second sleep in action. But that's not the focus of this post. So let's move on. Read this slow: I want to focus on just one part of the output which, is shown below. Notice the server process is sleeping for 3.4 seconds. If you look at the sqlplus script (near the top of this post), immediately after the 3.4 second sleep the server process issues a commit. Therefore, because the 3.4 sleep starts at 19:11:56.1 and I'm expecting to see some log writer activity in 3.4 seconds. This would be at 19.11.59.5. This could occur in the middle of the log writer 3 second sleep, which means we will likely see a log writer kick into action before their 3 second sleep completes! Let's take a look. We can see the server process 3.4 second sleep starting at time 19:11:56.1 and we can see the sleep end and the server process' next command begin at the expected time of 19:11:59.5. Next in the trace file output is result of the commit. The commit results in the wake of both the lgwr and lg00 background processes. 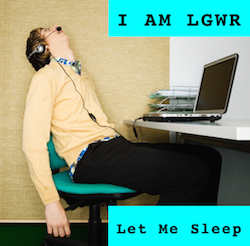 But notice the lgwr background process started one of its 3 second sleeps at 19:11:59.0 which means it doesn't want to wake until 19:12:02.0. But look at when the lgwr process woke up. It woke up at 19.11.59.5 which is clearly before the expected time of 19:12:02.0. What you just noticed was the lgwr background process was signaled to wake up before its three second sleep completed. But why did the lgwr need to be woken up? Because the server process' redo must be immediately written. But it gets even better because the lgwr background process doesn't do the redo write! The lgwr process signals the lg00 process to do the write, which we can see occurs at time 19:11:59:5. Wow. Amazing! We can see the 12c log writers involved. Not only lgwr. All log writer background process initiate a sleep for the default three seconds. I have seen situations where it is not three seconds, but it appears the default is three seconds. The server process signals the lgwr process to write immediately after a commit is issued. The server process signals the lgwr process to write using a semaphore. The log writers (starting in 12c) can signal each other using semaphores. We saw lgwr signal the lg00 background process to write. The log writers while normally put to sleep for three seconds, can be woken in the middle for an urgent task (like writing committed data to an online redo log).